What guest wouldn't love to receive this personalized Bar Mitzvah Candy Bar? And because you supply the Hershey bars, you save a lot of money on shipping, let alone on the candy itself. 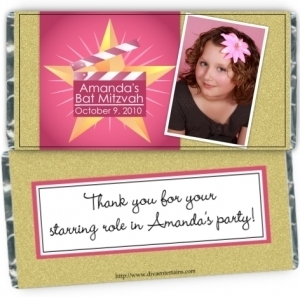 Our Bar Mitzvah candy wrappers are of high quality with clear, crisp colors. Our wrappers fit Hershey's full-size 1.55 oz. chocolate candy bars. We include silver foil as well as the personalized wrapper to mirror the original Hershey's candy wrapper. Easy, illustrated wrapping instructions are included in your order - all you need is a glue stick or tape. Candy is not included.